In all of my work in education, there has never been a more motivating or driving force than student voice. Additionally, we live in a generation where anyone in the world can take his or her voice and amplify it globally. But after reading Student Voice: The Instrument of Change by Dr. Russ Quaglia and Michael Corso, I realized that there is more to empowering student voice than simply handing a student a blog and telling him or her to write. In fact, one of the biggest takeaways from this work is that some students might not be prepared to amplify their voice to the world. 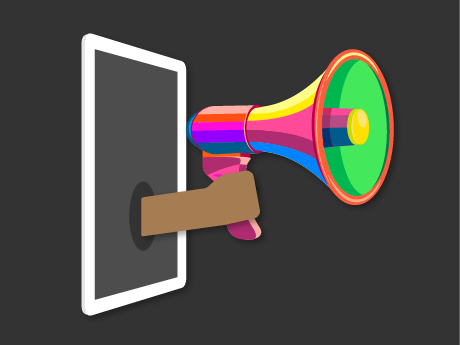 With Digital Learning Day fast approaching, I wanted to share some ideas that can help teachers nurture student voice before sending it off into the world. In any learning experience, it's always a good idea to look back before driving forward. Regardless of the subject, we can all learn valuable lessons from history. In the case of digital and social media, we have lots to learn as well. For many students, this is the world they were born into. Most of them don't know a world without the internet and a time before personal, mobile devices. Additionally, there is a lot of research circulating about the effects of screen time on young children and how it should be balanced. Before students begin writing a blog, they should understand how a blog came to be and what this funny word actually means (weblog). Students should understand what it's like to write a letter to someone and the experience of receiving a letter. I am certain that many students out there have never enjoyed the experience of receiving a handwritten letter in the mail. Writing a letter or even brainstorming ideas in a notebook is where a writer's voice burgeons. This is the laboratory where some of our greatest writers and journalists have started. The thought of a student, during his or her formative years, simply looking at a blank Google document with a blinking cursor is not a way to develop and nurture voice. There is a somewhat viral video circulating the Twittersphere titled You Are Not a Content Creator by Jonathan Mann. In the video, he breaks down the phrase "content creators" and portrays Google as simply an advertising company. I encourage you to watch the video and form your own opinion of his assertion. In the classroom, however, we should carefully approach student voice through a digital platform: do we want our students to simply be content creators? Or do we want them to be writers, musicians, artists, comedians, photographers, etc.? I'd say that most teachers would agree with the second question. In order for students to understand what the internet is and the amount of information that is populated on it every second, they need to conceptualize where their work will be published. Additionally, students should understand that when you write on the internet, it is permanent. It's the equivalent of writing in ink. They also need to be aware of various types of criticism that can take place in this public forum. We want students who post information online to be proud of their work and post it with a level of confidence. What's more, we want students to think of their work, portfolio, or blog as more than just empty content that drives advertisement revenue for Google. Students should be proud of whatever art form they share, and use digital media to amplify their work and connect others to it. If we're thinking 1,000 years, 3,000 years ahead in the future, we have to ask ourselves, how do we preserve all the bits that we need in order to correctly interpret the digital objects we create? . . . We are nonchalantly throwing all of our data into what could become an information black hole without realizing it. Reading this statement made me pause and think about how my work that I post digitally (this post, for instance) will be preserved for posterity. And how will it be interpreted by future generations, and through what medium? Will future technology devices even be compatible with the digital output we have now? And how will historians organize all of it to write about our current generations? While these questions are alarming, I have great faith in our country's innovation and ability to preserve history. What's important here is that we teach students understand the legacy of their content -- and to ensure that legacy. Student voice is something that we all want to amplify in education, but we must ensure that students understand what it means and how their work will project on a global stage. Digital Learning Day should provide an opportunity for students to understand how we got here, and empower them to create and design the next digital revolution. It is our job as educators to teach students about the non-digital times so that they can possess a greater understanding of the digital world they are developing.